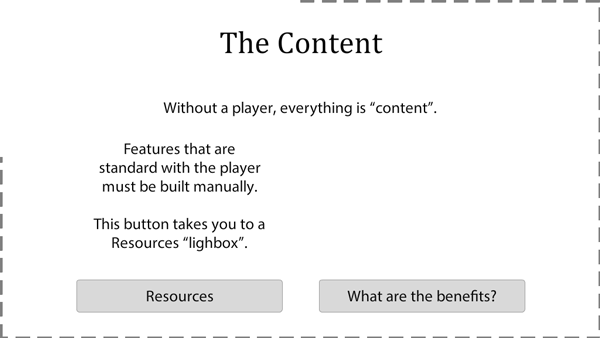 This utilitarian post shows three Storyline samples: one with the default player, one with an “invisible” player and a minimalist player. All have advantages… and disadvantages. All have their place in online learning. Selfishly, this post is for my clients so they are better informed when we have the “Player-No Player” conversation. Click the image to see a sample of the default player in action. 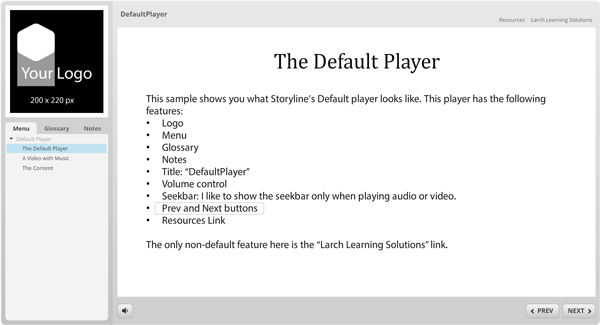 The player is flexible: its features, such as the menu, glossary, notes, title, etc. can be removed or configured. It can be any colour you want. It’s one of those “just because you can, doesn’t mean you should” deals. The player can be setup to be invisible by making all of its features transparent. Click the image to see a sample of the “invisible” player in action. Lately, I’ve been working with a minimalist player to take advantage of the menu, glossary, seekbar and navigation buttons, without the heavy grey presence of the default player. Click the image to see a sample of a minimalist player in action. 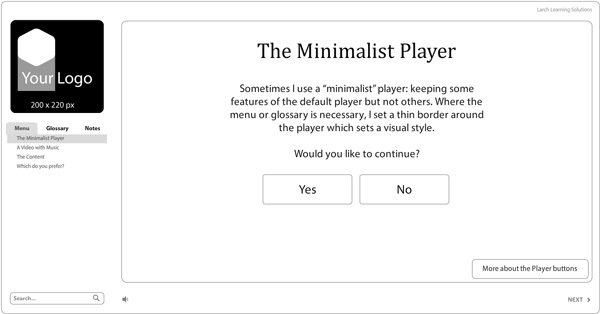 The minimalist player takes awhile to set up: there are a lot of little options to tweak and change. Annoyingly, every time I look at it I find something about it I want to alter. Being able to save the colour scheme in Storyline is a great time-saver when working on multiple projects. A visual style guide for each client is also helpful and something I develop for each of my clients. My favourite player is none at all. I love the look of the content, sitting alone, in the middle of a page, like it’s floating. What does your favourite player look like? I must say, Jane, that I agree with you that it’s nice to have less distraction on the screen. I guess one thing that comes to mind is not having a visible menu to easily go back to a slide. Thanks for all the different versions you provided! Yes, that navigation needs to be well thought out and tested. Thanks for dropping by, Daniela! I have been searching everywhere for a player like this, it is great! Any chance it is available to download? Hi Brittany! Thanks for commenting. The post includes three players… I’m assuming you mean the minimalist player. I’ll send it to you by email. Have a great day. Hi Jane! Love the minimalist and invisible player idea. is it possible to have a download of both? Hi Dan! Thanks for dropping by. I’ll send them by email. There’s a caveat for the Invisible. Have a great day!